Swimming... Back In The Pool! Swimming is an excellent exercise and activity you can enjoy with family and friends. So, why are so many of us afraid to get back into the water? Here are some of our issues and solutions. Don‘t go swimming immediately after you have put on a new pouching system. Make sure your pouch is empty. Picture framing your wafer with water-proof tape isn‘t necessary, but may give you the extra confidence you need. Avoid wearing pouches with filters in the pool. Water may get into the pouch through the filter. Filters may become ineffective after they are wet. 1. Women, choose a suit with a small, well-placed ruffle or skirt. 2. Men, choose a swimsuit with a higher cut waist or longer legs. Add a lycra or spandex undergarment. Consider a tank top to cover any scars and/or a waist high stoma placement. 3. Colostomates who irrigate may wish to wear a smaller, non-drainable pouch. 1. You may wish to change and towel off in a convenient bathroom stall. 2. Put on a dry, oversized shirt as a cover-up while you change. 3. A dry suit is easier to take off than a wet one. Relax by the side of the pool with a good book or a talkative friend before heading for the locker room. 4. Wear your swimsuit under a jogging suit/sweat pants and don‘t worry about changing at all. What about using the hot tub or Jacuzzi? Go ahead. Again, as long as your pouch seal is good and your pouch is empty you should have no problems with your ostomy. · Take it slow the first time out. Save those strenuous swims and dives until later. · Always leave a little air in pouch, to permit stoma drainage to fall down into the pouch. · When sun bathing, take a magazine or book to the beach or pool. Lay it open over your pouch to protect your pouching system (wafer) from the heat of the sun. · Test your pouching system. Fill the bathtub with water and soak for a few minutes. · Don‘t talk about your ostomy surgery at the community pool. If asked, talk in private. 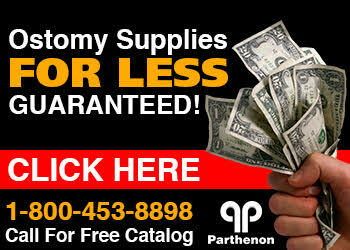 Shopping for Ostomy Supplies can be daunting at times, but with the help of Parthenon's skilled staff and 50 years experience you will get exactly what you want at the lowest price and fast! Try us for your wound dressing needs and any other medical products too!